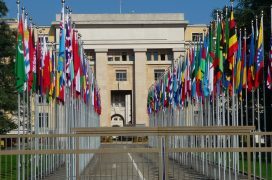 We work at the UN Human Rights Council on many issues, but particularly on the overuse of imprisonment, torture prevention, the abolition of the death penalty, women in detention, and the rights of children of incarcerated parents. While the issues of torture and ill-treatment in detention are raised within the UN Human Rights Council and its Special Procedures on a regular basis, the problems of the overuse of detention and severe overcrowding have traditionally been regarded as an issue of criminal law rather than a human rights issue. while the UN Tokyo Rules on non-custodial measures and the UN Bangkok Rules on non-custodial measures for women provide a framework for alternatives to both pre-trial detention and custodial sentences, there is no mechanism to monitor their application by member states, to recommend approaches to reduce the prison population compliant with human rights standards, or to compile good practice in non-custodial measures and prison decongestion. In September 2013, the Council took a significant move by adopting a resolution in encouraging States to address overcrowding in detention facilities. The High Commissioner subsequently submitted a report to the Council on the human rights implications of over-incarceration and overcrowding (in September 2015). It identifies both disproportionate sentencing policies and lack of non‑custodial alternative sentences as causes of overcrowding, drawing a clear link between over‑incarceration, overcrowding and violations of human rights and makes recommendations. Read PRI’s informal submission to this report. We now continue to advocate for the Human Rights Council and its mechanisms to address overcrowding and the overuse of imprisonment as a human rights issue. We made a joint submission with Harm Reduction International for the Council’s 2015 Study on the impact of the world drug problem on the enjoyment of human rights. The report recognises the disproportionate use of imprisonment for minor drug-related offences, such as possession, and calls for states to consider alternatives to prosecution in such cases. We also consistently raise the issue of increased imprisonment of women around the world, which is often a disproportionate and inappropriate response to women’s offending.